The frontal process protrudes posterosuperiorly in the middle of the nasal and lacrimal bones. Lateral surface is separated through a vertical ridge known as anterior lacrimal crest within anterior and posterior portions. The posterior part is dented and creates a portion of lacrimal fossa. Lacrimal crest gives connection to the medial palpebral ligament and is constant inferiorly with the infraorbital margin. The smooth area anterior towards the lacrimal crest merges inferiorly with the anterior surface of the body of the maxilla. Parts of orbicularis oculi as well as levator labii superioris alaeque nasi are fixed at this location. A vertical groove and a groove on the lacrimal bone merge with each other behind the crest in order to create the lacrimal fossa. It is part of the lateral nasal wall. A rough subapical area joins together with the ethmoid and covers anterior ethmoidal air cells. The medial surface of the frontal process is marked through a horizontal rim referred to as ethmoidal crest. An oblique ethmoidal crest joins posteriorly together the middle nasal concha and anteriorly underlies a ridge anterior towards the concha on the lateral nasal wall referred to as the agger nasi. The upper limit of the atrium of the middle meatus is created by the ethmoidal crest. 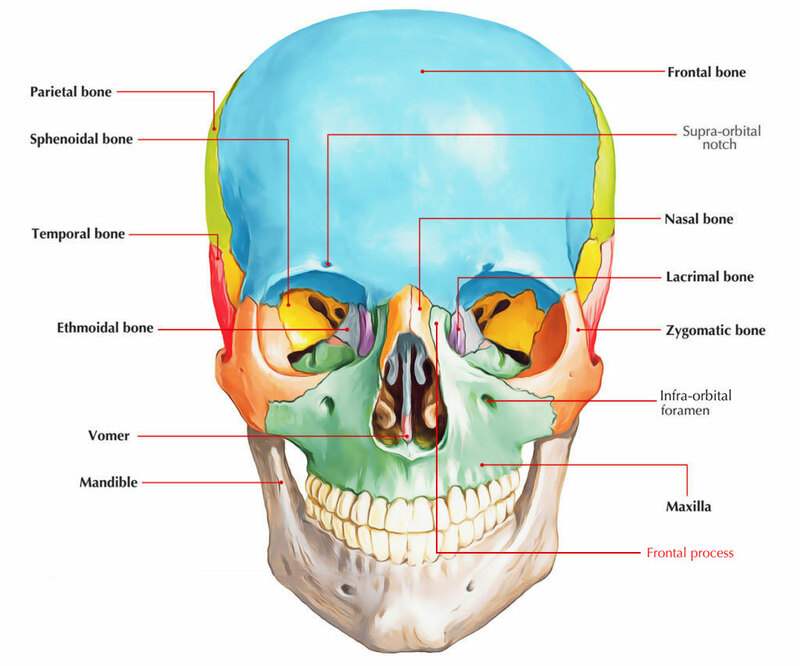 The frontal process joins with the nasal part of the frontal bone superiorly. Its anterior border merges with the nasal bone and its posterior border merges with the lacrimal bone. It protrudes upwards as well as joins with the frontal bone. Due to distribution of force of impact from teeth towards the base of the skull, the thick frontal process is located in the line of buttress. It slants downwards and forwards, and merges with the middle nasal concha. The atrium of the middle meatus is created by an area under the ethmoidal crest.